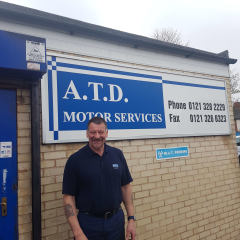 If you're looking for a reliable Car Garage in Birmingham, look no further than ATD Motor Services, specialists in a wide range of garage services including car servicing, engine diagnostics, mot, brakes and car repairs in Birmingham. Established in 1996, we provide an honest and reliable service at all times, proud to be recognised as a highly reputable car garage in Birmingham. Our Birmingham car mechanics are fully qualified and experienced in working with all types of vehicles, completing all work to the highest of standards at a very competitive price. Our mechanics are on hand to offer free, valuable advice on car servicing, engine diagnostics, and mot, and are happy to answer any questions you may have regarding your vehicle.